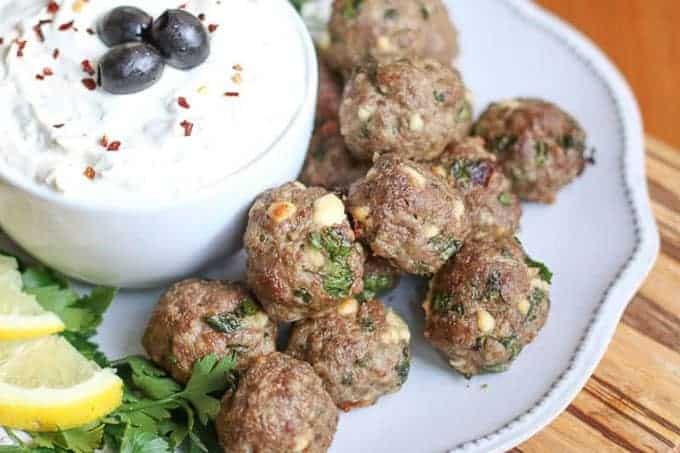 These oven baked Greek lamb meatballs are incredibly flavorful. The feta and Panko bread crumbs make these meatballs juicy and tender. They are delicious by themselves for an entree or add them to a pita for a tasty sandwich. Their bite size shape also makes them a perfect appetizer for entertaining. When I hosted my FitVine Wine tasting at my home, I created a Mediterranean themed dinner. I made these delicious Greek lamb meatballs as part of my dinner. I served them on a big platter and passed them around the table. I was busy running around and by the time I sat down at the table to put a few on my plate they were gone… vanished… disappeared! Just an empty plate remained. This wasn’t the first time I have made these for a party and they disappeared. In fact, every time I make Greek lamb meatballs, I never have left overs. I always double my recipe, so this has always perplexed me. How can my guests eat so many lamb meatballs? 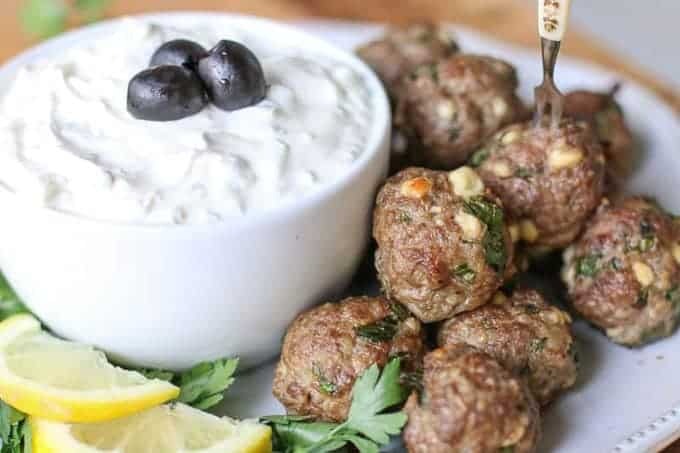 When I make lamb meatballs, I also make a homemade tzatziki sauce from Wanderlust Kitchen. It is authentic and tastes perfect. My husband doesn’t like a lot of dill (I do, and this drives me crazy!) so I omit the dill to appease him when I make this sauce. It compliments these lamb meatballs beautifully. I have seen in my Greek cookbooks where they will also cook the meatballs in a red sauce similar to a marinara. I haven’t tried this yet, but I think I will next time just to see what they will taste like. The trick is to lay them out on a baking sheet and make sure they don’t touch. Then freeze them about 30 minutes; enough to were they are very hard. Next throw them in a big freezer bag. They won’t stick! To make sure they won’t stick when you thaw them out; spread them out on the baking sheet you will cook them on. Then thaw them out before cooking. They will be fresh and moist when you bake them this way. How easy is that? You could make a couple of batches today! Use one batch for dinner and eat them on a pita or as the main entree. Then freeze the other batch for a party later. 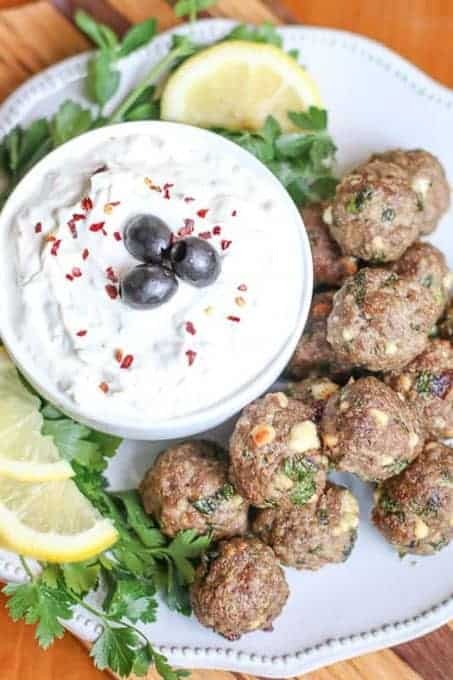 You can pop the lamb meatballs out on the day you are entertaining and you will have one effortless tasty appetizer! Hmm… now I am getting hungry…. I might just go and do this myself! I use a melon ball scooper to help shape my meatballs evenly. However, roll out about 32 meatballs a little smaller than a golf ball. Grease a baking sheet. Place meatballs on baking sheet giving them enough space not to touch and evenly cook. Bake for about 25-30 minutes or until completely browned. I have never made it that way, so I can’t answer that. If you make it that way and like it, let me know! Do you think this would be good with ground chicken or ground turkey? Oops! Thanks! It was a typo. I adjusted it. I use the flat leaf parsley in all of my cooking. These are delicious. Everyone loves them. Hope you do too! The recipe says 1/4 parsley. Is it a flat leaf parsley or an Italian curly parsley? And a quarter parsley what, a cup a tablespoon a bunch? Sounds delicious, but how do you make the sauce that goes with it? When cooking Greek food, there’s nothing like using lamb! 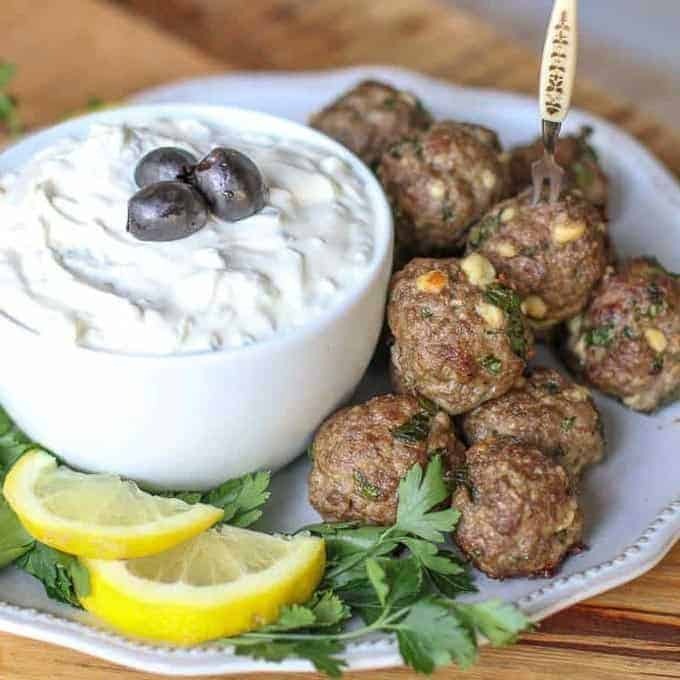 It’s one of the most popular meats in Greece and it gives recipes like these meatballs something extra special. I usually make a huge batch and freeze half for another time. Your recipes are always the best, love how the meatballs can be frozen, thank you for sharing! These look like a tasty addition to dinner! I haven’t had lamb in ages. I love this!!! Lamb is something that I love but I find I never know how to use it in different types of recipes … this is perfect and great for parties and game day celebrations! Seriously can’t wait to try these. We love lamb but usually don’t cook it too often in the summertime. I love the simplicity yet flavorful ingredients in this recipe. Perfect for a hot summer day! My husband is obsessed with lamb. He’ll be so happy if I make these, looks amazing! Lamb is my favorite red meat, so these meatballs are calling my name. Oh, I’d be crushed if my hubby didn’t like dill! I’ve not had lamb in so long, love the sound of this recipe and how easy it is too!